heh ... quantum entanglement isn't really needed, the Hameroff-Penrose Orchestrated Objective Reduction (Orch-OR) theory of consciousness will do, given research that also shows musical ensemble work will synchronize mental states between performers; if, as is seen in the neighbouring instruments (adjascent reeds will sympathetically sync like metronomes on a a skateboard) the cognitive collapse rates phase-lock, the each member in the ensemble would generate a quantum Orch-OR wave that adds by the wave-power equations (exponentially, not additively, hence why Lasers work) to emit a cognitive resonance that will fall off by the distance squared. Thus adding microphones to a performance doesn't really 'reach' any more people than without. The whole-system view is, of course, the only sane view, yet it is the view the concert promoters refuse to acknowledge because they themselves never go to these shows, they don't even know one artist from the next half the time, its just their business to sell units, be they flat bits of plastic or bums in seats. But given the vectors all over the room, from player to audience, but also player to player, audience to audience, people to room, all things every musician knows as true, if we could express the beauty and power of all that in our marketing, that sense that Cage called "an environment for self-discovery" (which is not 'self-actualization') then do you think maybe then people might want to come out of fear they may miss something their dreary lives desperately need? 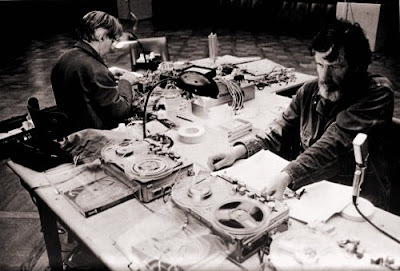 * Header image shows John Cage and David Tudor rehearsing their compositions Mureau 2 and Rainforest in Bremen in 1972. mrG's powerful last paragraph is all about achieving transmission, which takes us full circle via Zen Buddhism back to John Cage.